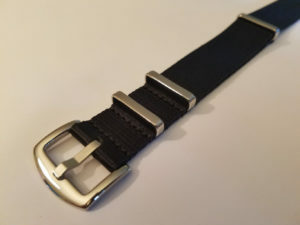 What is the difference between the Ocean Dog Premium Watch Strap and the Ocean Dog Seat Belt Watch Strap? 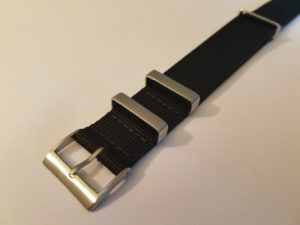 First, they are both premium nylon watch straps, so do not let the name fool you. What is the same on the straps? Both the Ocean Dog Premium and Ocean Dog Seat Belt are made from premium high-quality nylon. Both are checked for quality at the time they are made and prior to shipping. Each has great 304L premium stainless steel hardware, and both product lines are the same length. All the Ocean Dog straps have a return policy of 30 days. The Ocean Dog Premium is stiffer nylon. It feels heavy-duty, as in it feels unbreakable. The premium 304L stainless steel hardware features a stainless steel buckle and flat stainless steel keepers which, are a matte finish. The matte finish is a cross between a polish and matte so it goes great with almost any watch.The Ocean Dog Premium is available in Black/Gray (Bond), Black, Coyote Brown, Navy Blue, Olive Green, and Red. The Ocean Dog Seat Belt is more flexible strap. The nylon is weaved to provide a softer feel with a higher sheen. It is still a premium strap. The premium 304L stainless steel hardware has a seatbelt style stainless steel buckle, and flat stainless steel keepers. The hardware has a polished finished. The Ocean Dog Seat Belt is available in Black/Blue, Black/Gray (Bond), Black, Black/Orange, Black/Red, Dark Brown, and Light Green. They are both great straps just different. The straps are very comfortable and sturdy. The hardware (buckle and keepers) are very solid. These are amazing straps. I highly recommended them.